John Roth, Goshen College professor of history, has had many other jobs that include writer, editor and speaker. Roth has been working at Goshen College for thirty years, starting in 1985. For the past twenty years he has been traveling two weekends a month speaking at churches, conferences, conventions and other events. “My traveling has been a long-standing part of my job as a preacher and teacher,” he said. In the last year, Roth has taken on additional assignments that have him traveling even more often. In September he was in Germany, and then by October he found himself in Namibia. He has also travelled to western Canada, Spain, Pennsylvania, Illinois, Virginia and Ohio. Roth also added South Korea and Indonesia to the list in February. MWC has four commissions: deacons, faith and life, mission and peace. Roth is the secretary of the faith and life commission. Roth also started the Institute for the Study of Global Anabaptism, or ISGA, at Goshen College five years ago. Roth’s trip to Namibia was an invitation from the Lutheran World Federation. 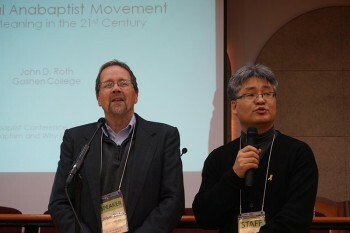 Roth went to South Korea at the invitation of an indigenous Anabaptist movement. They held a conference on the theme “Anabaptism today,” and invited Roth to speak on the topic of being an Anabaptist in the 21st century. Roth’s travels to Indonesia were also MWC related. In 2017, the commemoration, called Renewal 2027, will start in Germany, and will move to Kenya, Central America, western Canada and Indonesia each year after. The location for the final five years have yet to be planned. Roth says what is behind Renewal 2027 is the growth of the Anabaptist movement from 600,000 people 30 years ago, mostly in Europe and North America to 2.1 million people today, with the large majority being in Africa, Asia and Latin America. Outside of traveling for the ISGA and MWC, Roth has authored eight books. “I’ve tried in much of my writing to draw on my work as a scholar but to write for a general audience,” said Roth. One such book, “Choosing Against War: A Christian View,” worked to make a basic case for Christian pacifism. “I found a calling to write in a language that communicates with ordinary people,” said Roth. Lucky for us, Roth teaches right here in Goshen, despite his extensive traveling. As Roth travels, learns and writes more, that breadth and depth of knowledge is devoted to the classroom, giving history a very real connection.